Have you ever had a pair of boots that you just love but you feel there's a good chance you may just go flying on to the floor walking in them? As soon as I tried these boots on, that was these boots for me. Gorgeous on, but I suddenly felt very unstable in them. Not because of their height mind you. It was because on the smoothness of the bottom of them. They had no grip whatsoever...but I bought them anyway. The first thing I done before I even wore them was get them resoled. It added to the cost but it was so worth it. One of the girls said they wouldn't even think to do that. Being honest, I've done it a few times. Boots are made for walking after all. I do take care of them. I just got them re-heeled last week before they wore down too much. I feel like I've a new pair of boots again. Happy Days! 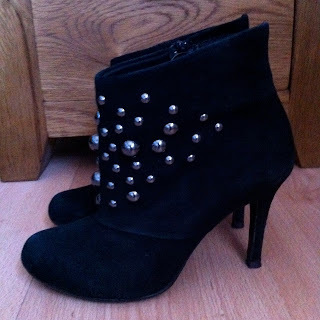 these studded boots are gorgeous!